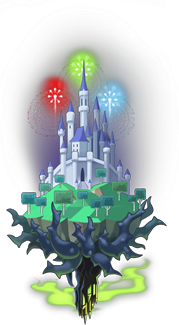 Enchanted Dominion is a world that is featured in Kingdom Hearts Birth by Sleep and Kingdom Hearts χ. It is based on the Disney film, Sleeping Beauty. Enchanted Dominion is a realm that includes the castles of Maleficent and King Stefan. The highest point of King Stefan's castle is the Tower Room (屋根裏部屋, Yaneuraheya?, lit. "Attic Room"), down the stairs from which is Aurora's Chamber (オーロラの部屋, Ōrora no Heya?). Outside of this room is the Hallway (廊下, Rōka? ), which leads to the stairs down to the Audience Chamber (謁見の間, Ekken no Ma?). Through the gates of the castle, a Bridge (橋, Hashi?) connects to the Forest Clearing (森:広場, Mori: Hiroba?, lit. "Forest: Square"), past which is the Waterside (森:水辺, Mori: Mizube?, lit. "Forest: Waterside"). Beyond this is the Forbidden Mountain (魔女の城:入口, Majo no Shiro: Iriguchi?, lit. "Witch's Castle: Entrance"), which is the edge of Maleficent's territory. At the top of the Mountain lies Maleficent's Castle (魔女の城, Majo no Shiro?, lit. "Witch's Castle"). When you enter the castle, you'll end up in the Gates (門, Mon?). Proceeding further inside will lead you to none other than Maleficent's Throne (玉座の間, Gyokuza no Ma?, lit. "Throne Room"). Going left from the throne will take you to the Hall (祭壇の間, Saidan no Ma?, lit. "Altar Room"). Navigating the hall until the far end will take you to the Dungeon (地下, Chika?, lit. "Basement"). Below the Dungeon is the Dungeon Cell (牢屋, Rōya?). Chasing a Fluttering into the Enchanted Dominion, Player comes across Prince Phillip listening to Aurora as her voice carries through the forest. After introducing himself, Phillip leaves to seek out Aurora, but is pursued by the Heartless. Chasing after Phillip, Player watches as he connects with Aurora, though when he attempts to join the conversation, Chirithy stops them to allow Phillip and Aurora some time alone. When Aurora runs off, Chirithy encourages Player to follow her, as the former deduces that Aurora is another of the pure lights that the Heartless are after. Player saves Aurora from the Heartless, but she hurries off on her own again without giving her name. Before Player can follow her, the Fluttering which they had chased into the Enchanted Dominion passes by, and Chirithy opts to hunt it down instead. Player follows the Fluttering to a cottage, where Flora, Fauna, and Merryweather are being swarmed by several more Flutterings. Player dispatches the Heartless, and though the maidens are wary, they are ultimately grateful for what they had done and noisily resume their plans for a birthday party. Chirithy draws attention to the magic spouting out of the chimney, which Maleficent's Raven is watching intently. Aurora then approaches and invites Player in as thanks for saving her. Inside, Aurora learns that she is a princess who had been separated from her family at a young age and that she is set to marry a prince. Distraught that she can never see Phillip again, Aurora runs to her room in tears. Having leaned in on the conversation through an open window, Maleficent's Raven returns to the Forbidden Mountain in order to report what he has learned to Maleficent. As Flora, Fauna, and Merryweather prepare to take Aurora to the castle, they ask Player to help defend them against the Heartless. Although they part ways just outside of the castle boundaries, Chirithy worries about Maleficent and urges Player to follow after them. In the castle, Aurora is guided by Maleficent toward a spinning wheel while the fairies give Aurora a moment alone. Having caught up, Player joins Flora, Fauna, and Merryweather in their pursuit of Aurora. Along the way, Maleficent summons Thornsnake to buy her some time. After defeating the Heartless, Player and the fairies find that Maleficent has made Aurora touch the spindle of the spinning wheel and entered her eternal sleep. Ashamed by their failure, the three fairies put the entire kingdom to sleep until Aurora wakes. Chirithy suggests that Aurora's heart has not been put to sleep, but unable to do anything else, Chirithy and Player leave the Enchanted Dominion, vowing to return. Waking up in the Enchanted Dominion, Player voices their confusion to Chirithy, having just experienced a nightmare that detailed the events of the Keyblade War. Chirithy asks if it had been the same usual nightmare, revealing that Player had been having such nightmares ever since Ava invited him to join the Dandelions. When Player asks why they had been sleeping in such a strange place, Chirithy reasons that it must have been the fatigue and notes their time in the Enchanted Dominion has made Player more open-minded. While skipping through the forest, Chirithy notes that their path to the castle has been blocked by a thicket of briars, opting instead that they come back once they have figured something out. Maleficent's Raven flies overhead as the two leave, reuniting with Maleficent on the other side of the briars. Reviewing her success, Maleficent questions where Pete wandered off to, though she is ultimately unconcerned, knowing well that Sora and the others cannot meddle in "this world" since nothing can get through. Terra visits this world first in his journey. He arrives in a meadow by a lake, and is greeted by a swarm of Unversed. He chases one to the bridge outside the castle, where he meets the evil fairy, Maleficent. She wonders why he is not asleep like the rest of those in the kingdom. Terra says he is a visitor looking for a man named Xehanort. She does not know the name but says she met a man "searching for the light" in the castle and believes he meant Princess Aurora. Terra runs off to the top of the castle and meets the sleeping Aurora. He senses a strange light from her. Maleficent appears and tells him that Aurora is a Princess of Heart, seven maidens who lack any darkness in their hearts and hold the key to controlling all worlds. She also senses the darkness in Terra's heart and hypnotizes him into stealing Aurora's heart. Once the deed is done, he realizes the terrible thing he has done, while Maleficent revels in the power she has obtained, also noting that the man she met was correct. A rumble suddenly shakes the castle, Maleficent saying it is an Unversed in the castle, and then disappears. Terra descends the castle and fights the Wheel Master. As he leaves over the bridge, he decides he has to abstain from using his darkness. Maleficent watches him leave, and reiterates the power that the Princesses of Heart hold. Ventus visits here shortly after Terra's departure. He finds Aurora sleeping at the top of the tower and is approached by the three fairies, who mistake him for an enemy. After he reveals he is on their side, they tell him how Aurora has been put to sleep and losing her heart. Ven promises to help and follows them to the Forbidden Mountains. The four enter Maleficent's fortress to find the stolen heart. They are able to find it deep within a maze guarded by Maleficent's goons. As Ventus releases the captive heart, he sees memories of when Aurora met Prince Phillip in the woods. In the meantime, Aqua enters Enchanted Dominion at the base of the Forbidden Mountains, where she sees Aurora's heart flying through the air towards the castle. She investigates the cause of this occurrence. As Ventus leaves, he comes to Maleficent's throne room, where the witch recognizes his Keyblade, and tells him that Terra stole Aurora's heart. Ven thinks she is lying and the two battle. With the three fairies help, Ven defeats Maleficent, who still haunts Ven with the act of Terra's dark power. However, Aqua runs in and tells Ven she must be lying. Ven, remembering how Vanitas told that Terra would change, leaves the world to find his friend. After Ven runs off, Maleficent tells Aqua about the power of the Keyblade and how Terra had helped. She asks Aqua if she would like to help her too, but Aqua flatly refuses. Maleficent notes this is just as Master Xehanort had said, then causes the ground beneath Aqua to crumble sending her to the dungeon. It is there that she meets an imprisoned Prince Phillip. Sensing his true love for Aurora, they escape with the three fairies. As they cross the bridge to the castle, Maleficent covers the bridge in thorns and appears before the heroes. Aqua asks her about Xehanort and Terra, but the witch insists that Terra succumbed to his darkness. She then transforms into a dragon and attacks Aqua and Prince Phillip. Aqua gets separated by a flame, but the fairies enchant Phillip's sword, which is thrown into the dragon. Phillip runs up the castle and awakens Aurora with a kiss. Maleficent, not quite defeated, limps away, as Aqua tells her that she stands no chance against hearts of light. Maleficent rebukes her, saying that as long as light exists, so will darkness, and swears her return. In the end credits, Maleficent is seen standing on the bridge outside the castle before turning her robes to black out the screen. Inside, Aurora and Phillip dance together while Flora and Merryweather change the color of Aurora's dress between pink and blue. With Pete's assistance, Maleficent plotted to capture Aurora and the remaining six Princesses of Heart. Eventually, the darkness in her heart drew the Heartless to Enchanted Dominion. Fascinated with these creatures, Maleficent used her powers to gain control of them. With their aid, she captured Aurora and allowed them to eat the heart of Enchanted Dominion, destroying the world and sending Flora, Fauna, and Merryweather to the Mysterious Tower. Aqua would eventually come across the thorn-filled remains of the world, which lead her to a fight against multiple Darksides at the Forbidden Mountain. Terra's lost heart was able to make contact with Aqua afterwards, but Xehanort attempted to use their link to find out where Ven was being kept, causing another Darkside to pull Aqua away into a portal to Destiny Islands. When the Door to Darkness was sealed, End of the World came apart. All the fragments of the lost worlds regained their lost hearts and regenerated into the complete worlds they once were. Enchanted Dominion was among them.